Recycling business in Bangladesh not only allows making a profit but it helps the environment clean. However, as it’s a large undertaking, you’ll face serious competition and challenges. You can get your recycling business up and running while making a detailed plan. Also, it helps to lock in financing, understanding the legal requirements, and using good business sense. So, you need to offer a service that is in demand to be profitable. And it may be best for you to focus on other materials to get rid of because a lot of City Corporations and municipalities offer recycling pickup services for items like paper and glass. That’s why the absolute essential is a well-balanced business plan and market research. It’s a great time to start a recycling business in Bangladesh as China is purchasing almost all scraps, especially plastics. The growing economy of Bangladesh is also growing a lot of recyclable products. For example, all excellent potential feed-stocks the materials like a plastic bottle, the cases from the recycling of appliances and computer equipment etc. It would also be a large, low-cost consistent supply for you when you’ll process recycle the residuals from auto shredding. Besides, find out what recycling businesses already exist in your area and where you’ll be able to sell materials and for how much. Just you need some practical experiences and a high level of confidence with patience. So, as the aspects of Bangladesh, we suggest starting a plastic recycling business. You’ll find there are many different types of recycling businesses when you’re in the recycling business in Bangladesh. It’s much essential to choose the niche what you’ll collect and recycle in this industry. For example, you can recycle collecting plastic bottles, furniture and working appliances etc. But, you should remember one thing, the commodities market is volatile. It means that your profit margins can change very quickly. And the going rate for materials like metal and paper can change dramatically depending on the current market conditions. So, let’s know some basics to consider towards your new launch whether your goal is to start a recycling business in Bangladesh. For your recycling businesses in Bangladesh, you may have already gravitated towards a specific niche. It’s as essential as the planning of the business. This is because the recycling business has a lot of things to do and you can’t do all of them. For example, there is plastic, metal, paper, and many more things to recycle. 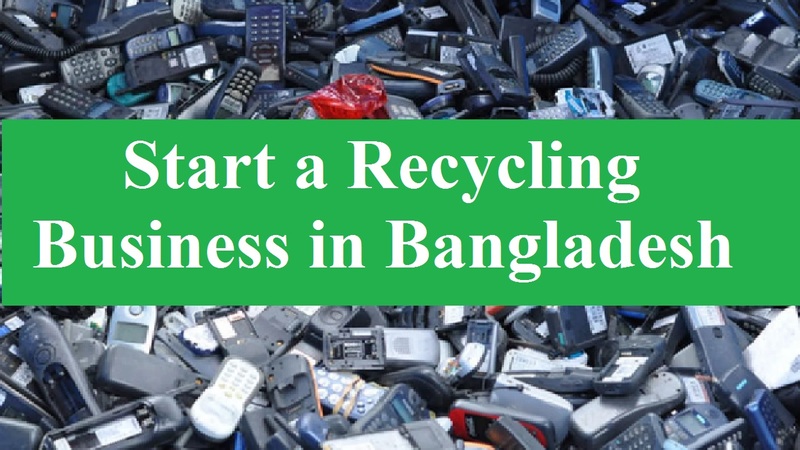 You’ll need to figure out how much and how to get the required business funds when you’re going to start a recycling business in Bangladesh. You have several options beyond traditional bank loans if you need to borrow money. Also, there are some big microfinance organizations that provide entrepreneurial loans, such as Grameen Bank, BRACK, ASA etc. But, you can’t help planning your sources of the business funds to run it smoothly. Making a draft of your marketing ideas and strategies for your recycling company is essential. Also, it’s important to ensure that you create a compelling personal and company’s profile. Moreover, you should the profile of your product in a compelling and quality way. It’ll definitely give you leverage in the marketplace than your competitors if you have a showcase of a quality product. That’s the reason you must do all you can to maximize any opportunity that comes your way. It means that until you do marketing your business, nobody will know it and come to you to get the products or services. You’ll always have suppliers and distributors surrounding you until you’re churning out quality products with every batch of production. If therefore they’re ready to pitch their tent with you and not with other individuals then your products will definitely make them smile. Moreover, a reliable supply of the materials is needed day in-day out as a company that will rely so much on raw materials that are already used by the end consumers. And it’ll guarantee they supply you regularly when you regular pay of the supplier’s product. You’re likely not going to struggle to compete in the industry if you possess the required expertise and equipment to execute recycling without environmental breaches. Thus while handling any contract with potential customers, ensure you put in your best whenever you have the opportunity. Also, if you’re familiar with delivering efficient services and quality products at all times then it’ll be a plus point. Moreover, as they are now your partners, not competitors, it’ll sure give you a competitive advantage over your competitions when possible form strategic partnership with other companies.